Tapping on a song title in the heads-up display area of the menubar will open the Quick Pick screen. This screen is designed to let you quickly find a song in a live scenario, preview, and add it to your existing set for viewing. 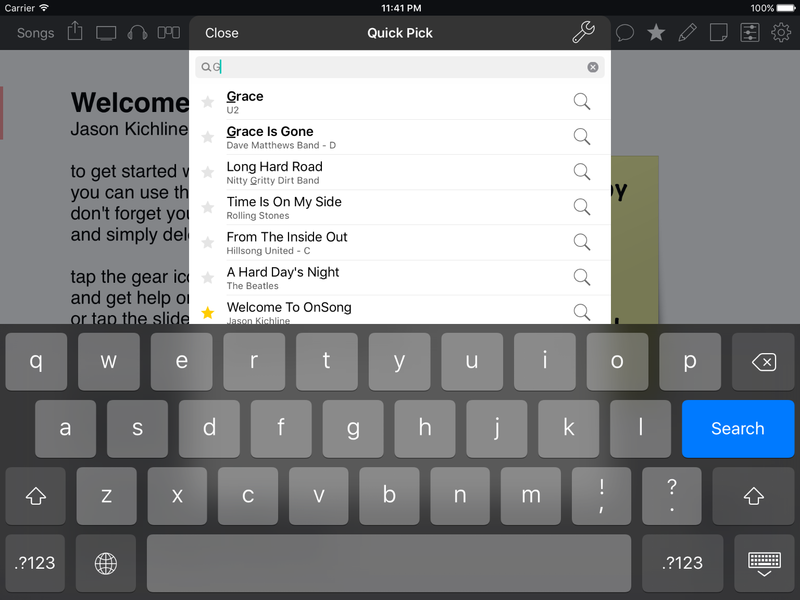 When the Quick Pick screen appears, the keyboard is automatically revealed so you can just start typing. As you type, OnSong finds matches in your library that contains the title of the song or the artist. Songs that have titles beginning with the search text will appear in dark text. Other results will appear with the search term underlined. Results that start with the term are sorted towards the top of the list. Once you've found a song you'd like to play, tap to pick it. If you are currently viewing a set, the song is automatically added as the next song in the set. If you are viewing a single song from your OnSong library, tapping on the song will display it in the Song Viewer immediately. In both cases, the Quick Pick screen is automatically dismissed, returning you to the song viewer. Note: Picking songs will use options from the Quick Pick Options menu. While the song is added as the next song in a set, you can configure OnSong to automatically jump to that song. You can also determine if songs are added temporarily to set. If you're unsure if the song is what you are looking for, tap on the magnifying glass icon on the right side to view a preview first. Tap on the options icon in the upper-right corner to change change options on how songs are added to the song viewer.